I actually have a whole folder of this sitting in my 'to-do' piles. But those photos are horrendous. I took them at night and the lighting is just way off. I do not have expensive professional lightings for product shoots so I rely a lot on natural sunlight and the flash on my camera. 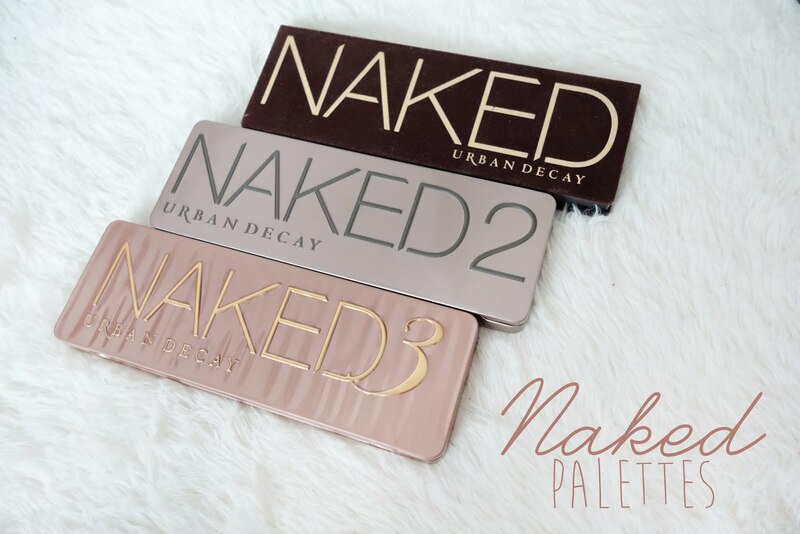 This has got to be one of the most popular palettes in this range. It is a mixture of warm and cool tones; making this palette a very versatile one. 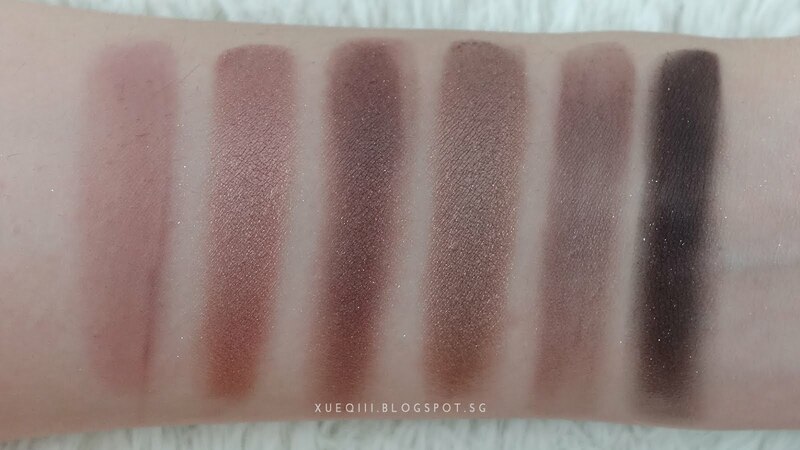 All these 6 shades are quite consistent through out - creamy and pigmented. Virgin is a shimmery pale beige shade, great for a brow bone highlight. Sin is a shimmery pink shade. Very pretty and although I don't look good with this all over my lid, I do like it mixed with other shimmery shades and apply it on the center of my lids. 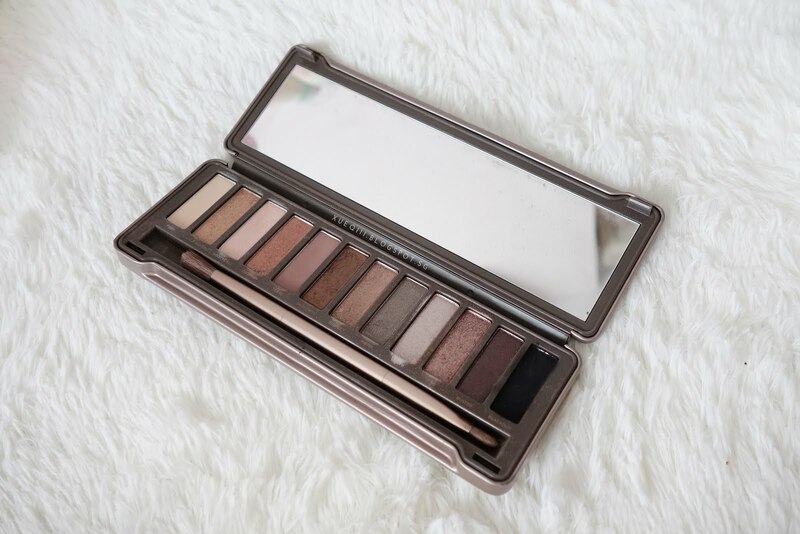 Naked is a matte light brown, perfect as a crease shade to start off with. 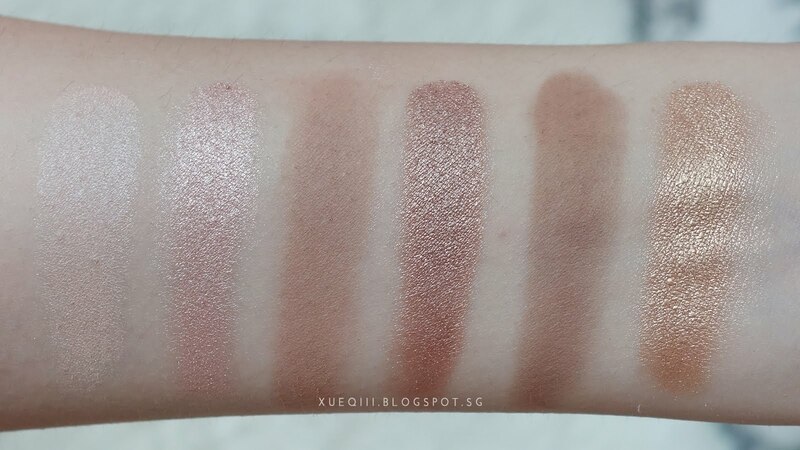 It is very easy to blend. Sidecar is a metallic taupe-y brown shade. This has got to be one of my favourites in this palette. 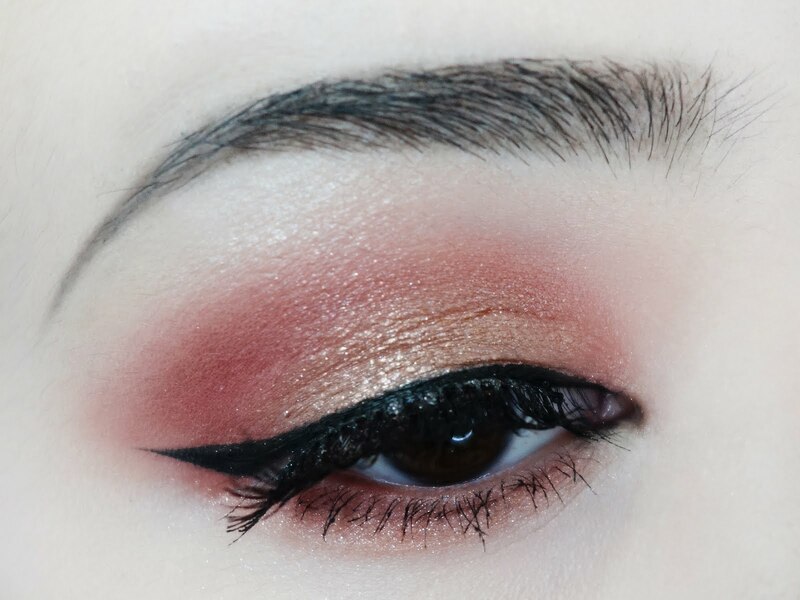 Looks amazing as an all-over the lid shade. 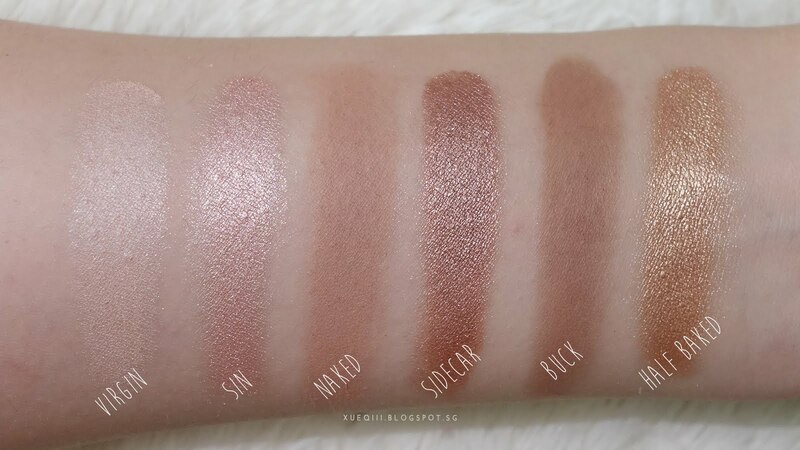 Buck is a darker matte brown shade, just a few shades darker than Naked. 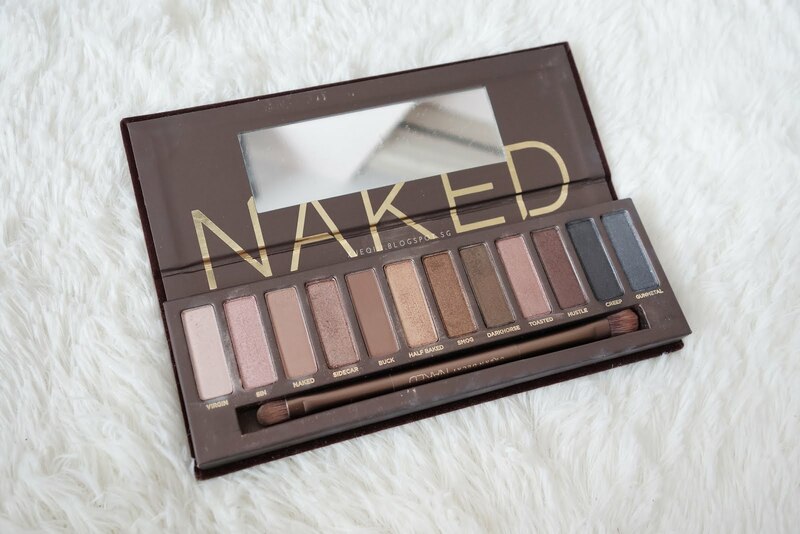 I like to use this to darken my outer v.
Half Baked is a metallic gold shade. 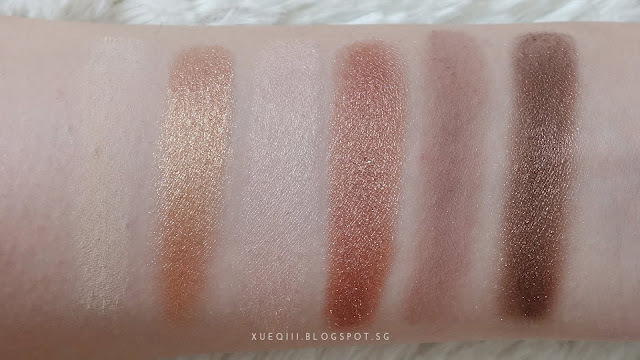 This is another very popular shade and it looks very flattering when you want to achieve the golden bronzey makeup look. 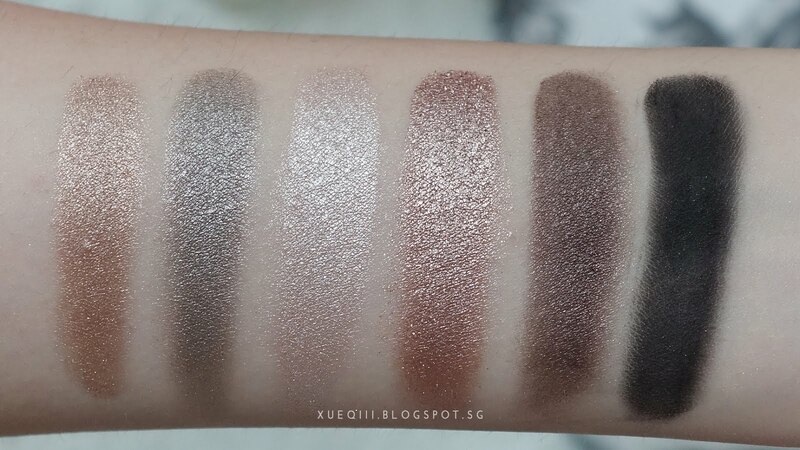 Smog is a metallic bronze shade; very pigmented and buttery. Darkhorse is a shimmery dark bronzey brown. 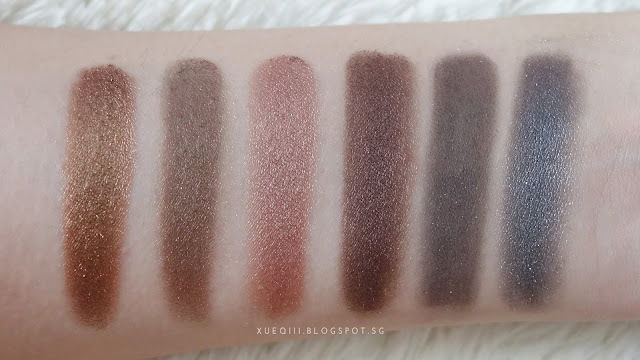 This isn't the most pigmented shade but perfect for building up a darker smoky look. Toasted is a beautiful shimmery copper brown shade. 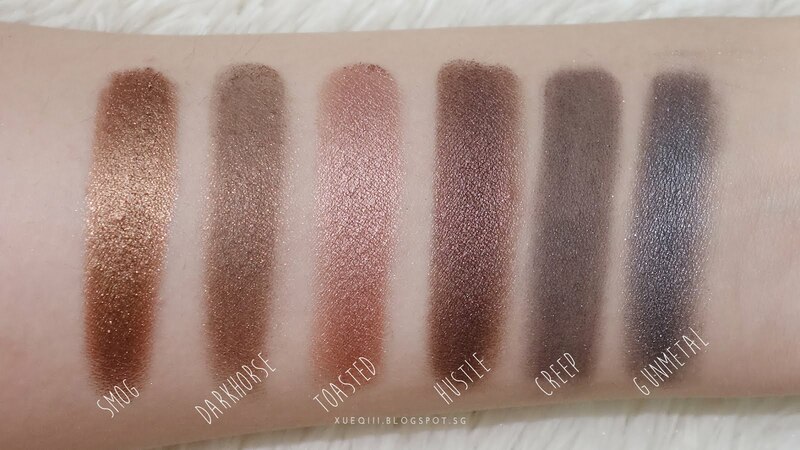 Hustle is a dark shimmery chocolatey brown shade with a very slight hint of purple. Creep is a dark greyish black shade with some gold glitters. This is one disappointing shade as it has very poor colour payoff. 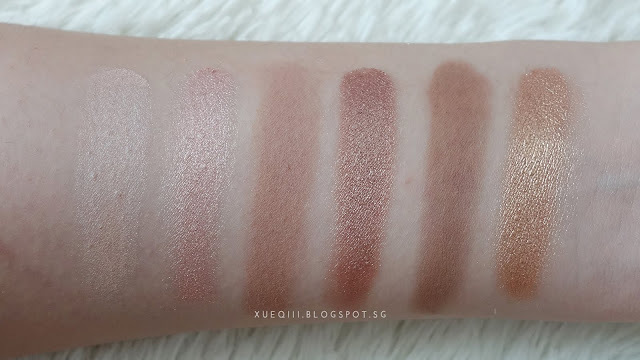 The swatch is after 3 swipes and it is still very sheer. Gunmetal is a shimmery gunmetal shade - silver grey. 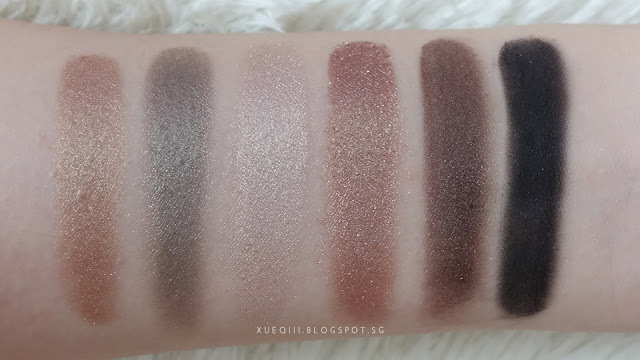 This shade has a beautiful sheen and although I do not reach for this much, but I can see how well this will compliment a cool tone smoky eye. This is the first Naked palette I bought with my first pay cheque on my internship. I loved it. It has mainly cool tones and light touches of mauves. 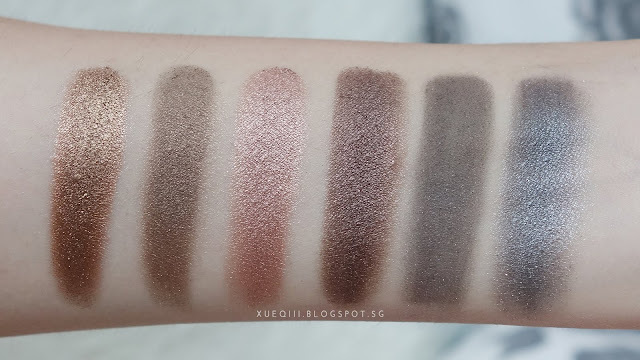 The quality of this palette is more consistent and all the shades works well, none of the shades are chalky or sheer. Foxy is a matte yellow shade for setting the eyes and evening out veins on the eyelids. 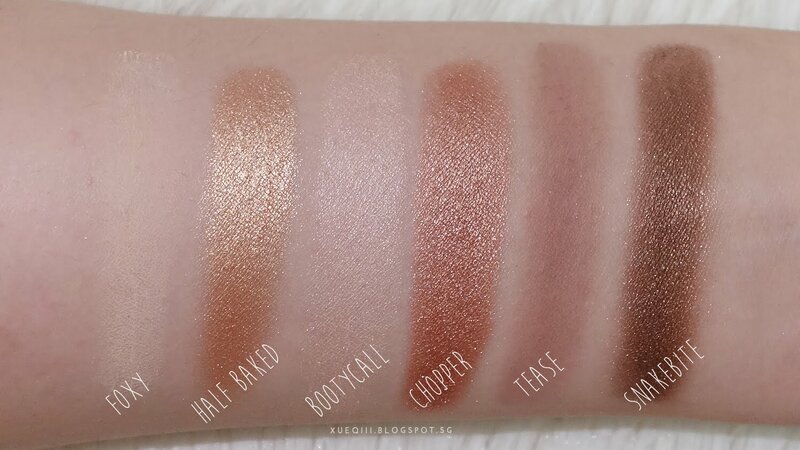 Half Baked is a metallic golden shade; repeated shade from the Original Naked Palette. Bootycall is a shimmery skin tone champagne-like shade, perfect for highlighting the inner corners and brow bone. Chopper is a metallic copper shade, like rose gold. One of my favourites. 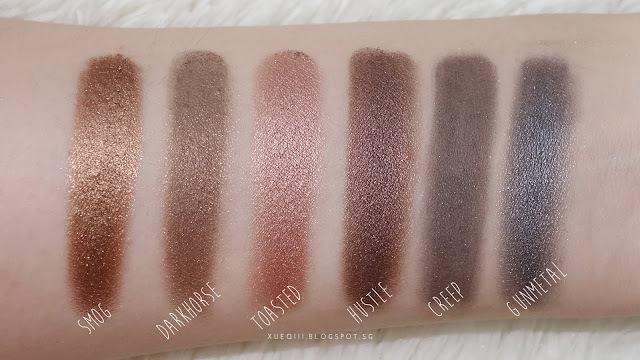 Tease is a purple mauve matte blending shade. 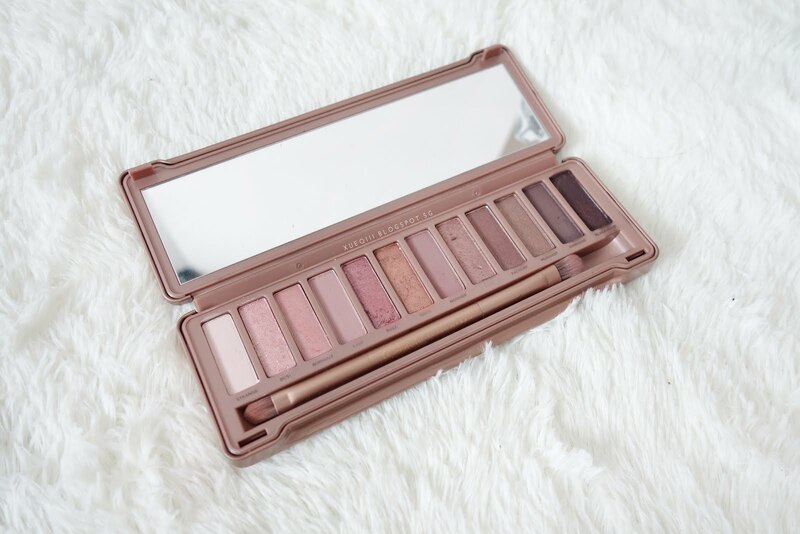 Compliments the rest of the shades very well. Snakebite is a metallic taupe-y bronze. Another one of my favourites. Very well loved. Suspect is shimmery taupe shade. Cooler and a few shades lighter than Snakebite. Pistol is a shimmery grey shade. Verve is a shimmery silver shade. YDK is a metallic taupe brown with a hint of purple. This has got to be my favourite. Super shiny and pigmented. 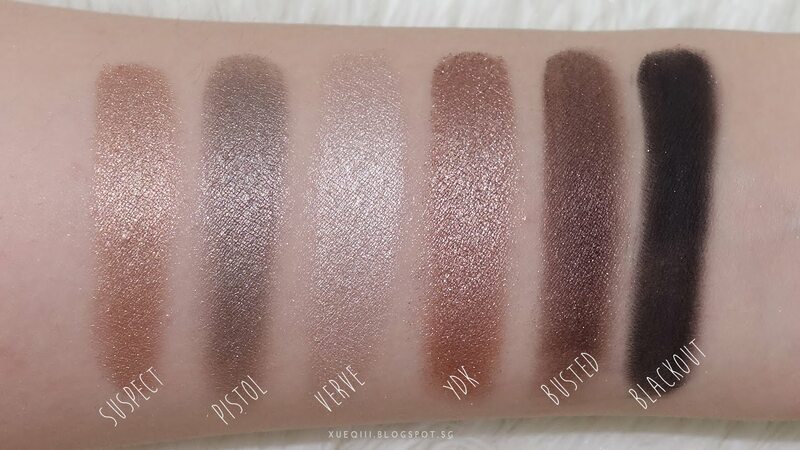 Busted is shimmery dark brown. Blackout is a super dark matte black. Perfect to double as a liner when I want to achieve a softer look. 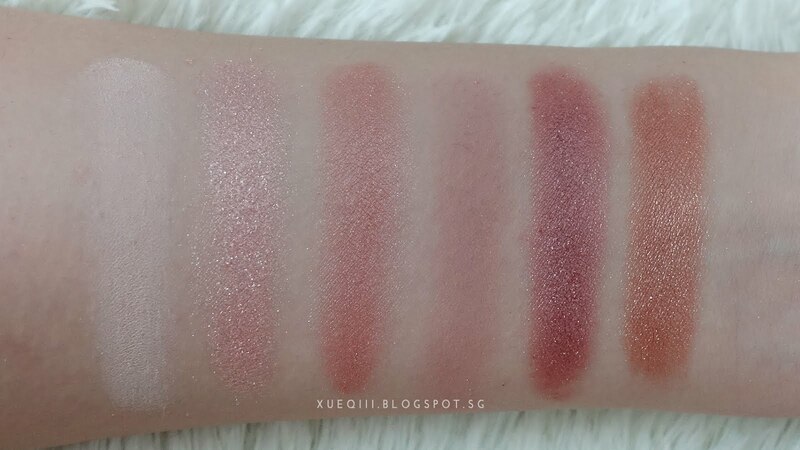 This is a very romantic and pinky rose golden palette with softer colours. Definitely on the cooler side. Strange is a matte pale beige shade. 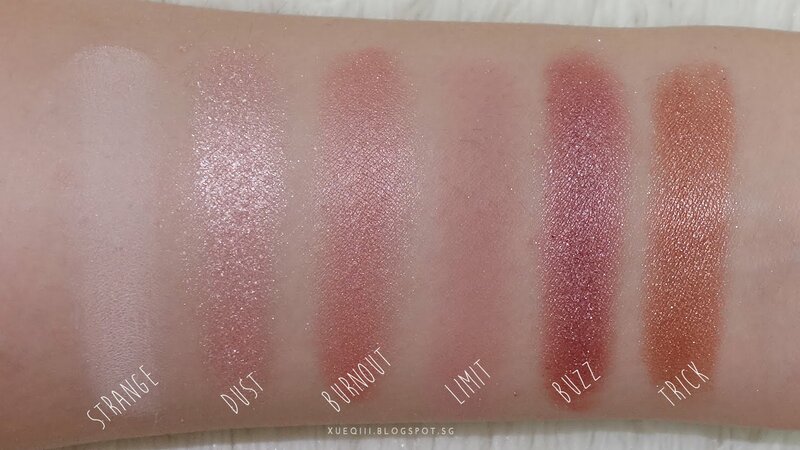 Dust is a glittery pink shade. This shade is slightly chunky but I guess that is how the shadow is meant to be. But this can be a bit hard to work with due to the chunkiness. Burnout is a shimmery pink. Limit is a matte light mauve shade for blending and crease work. Buzz is a shimmery darker pinky rose gold shade. This shadow is on the drier side as well and takes awhile for it warm up. Trick is a shimmery golden shade. I really like the colour but this shadow is soooo stubborn and it indeed is tricky to work with. I had to scrap the surface of it to get more colour payoff. Nooner is a darker matte mauve. A darker version of Limit. 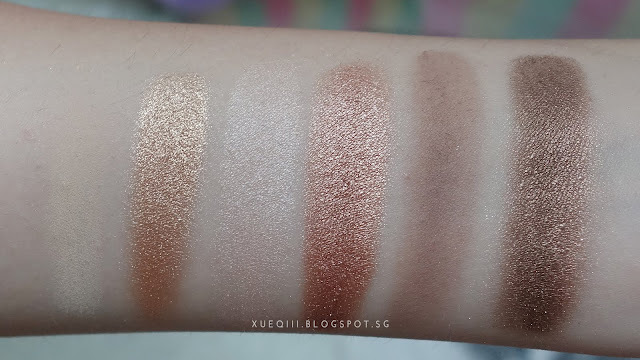 Liar is shimmery mauvey brown. 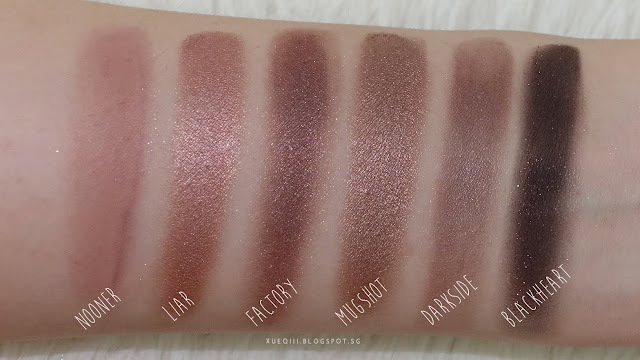 Factory is a shimmery dark brown. 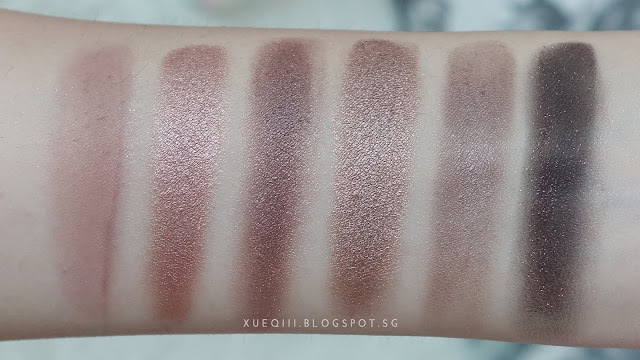 Mugshot is a shimmery taupe shade. Darkside is a dirty brown with a sheen, but has super poor pigmentation. 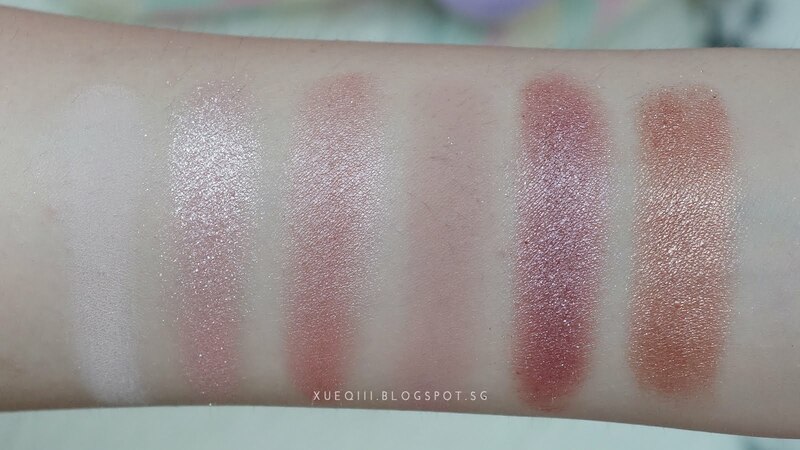 You can see how patchy it swatched. Blackheart is a charcoal black with some purple / pink and gold glitters. I quite like using this as a liner.